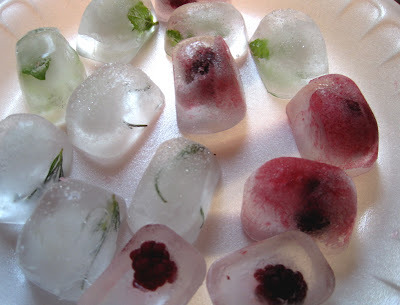 It's not that hard, I know, yet still I don't often go to the trouble of making my own decorative and flavored ice cubes. Over the weekend I did, and the results are so pretty I wanted to share them with you! My favorite is the mint. 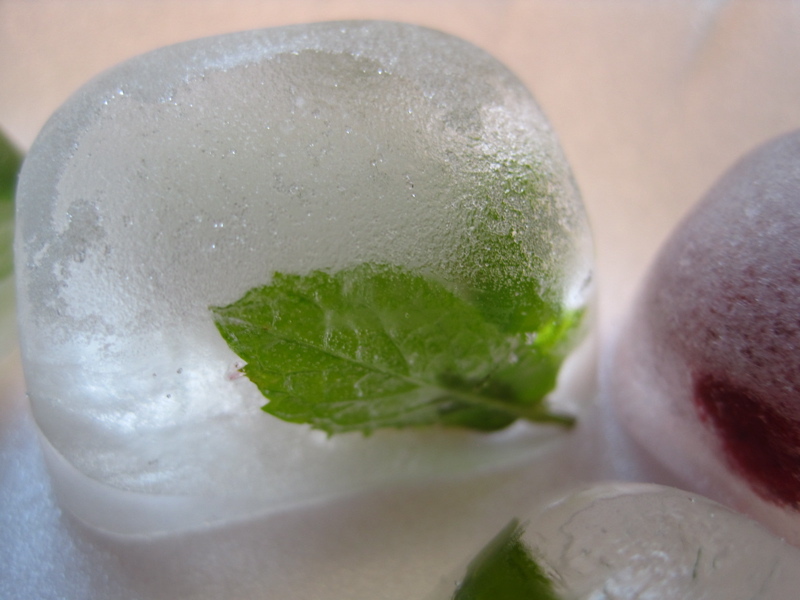 The leaves look pretty and retain their shape and color when frozen. I also tried some rosemary, but it ended up looking a little spiderlike to me! 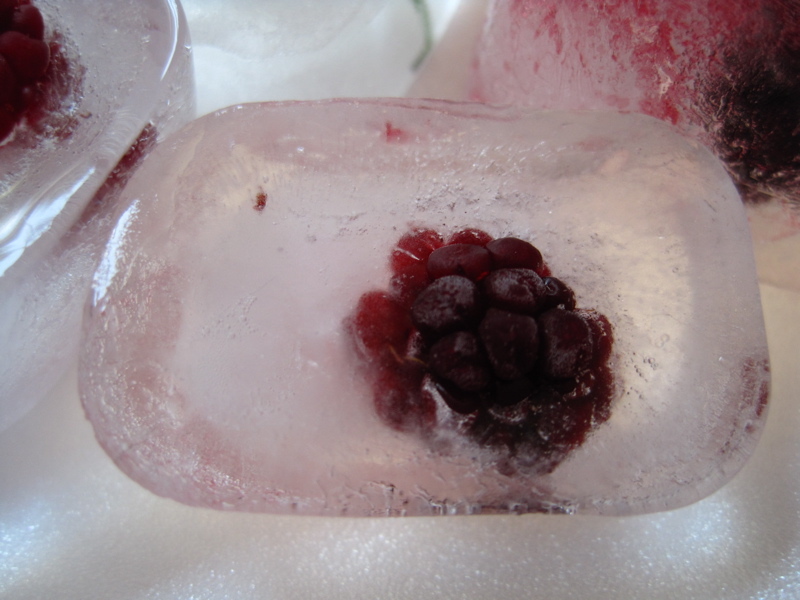 The blackberries froze well, although some of them (in background) colored the whole cube. 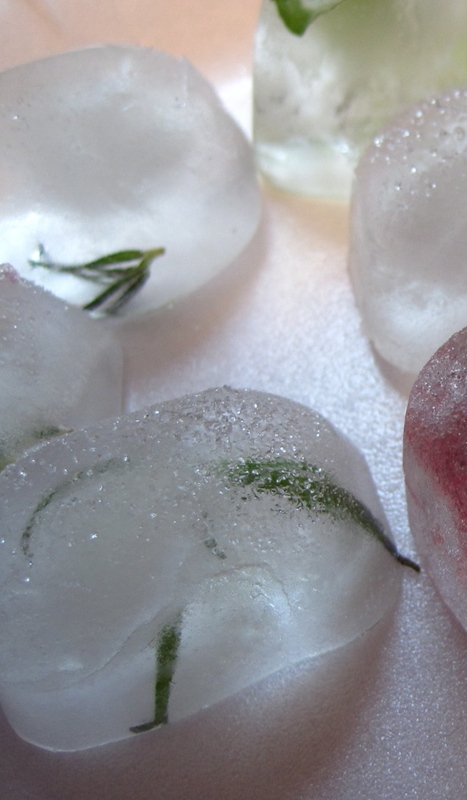 Do you like to gussy up your ice cubes for summertime iced tea drinking? If so, what do you use? Tea friend Steph observed recently that the ready-to-drink (RTD) or bottled tea market has exploded, and I thoroughly agree! I try to sample every new (to me) flavor at least once, and I found these two bottles for $1 each at a local discount store last week. 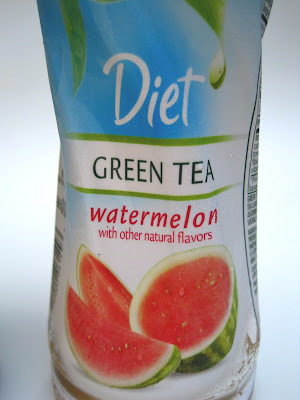 Lipton's Diet Green Tea with Watermelon was a fruity tasting drink, and I did enjoy it, but it tasted like something berry-ish and not necessarily watermelon-ish to me, so that was a little disappointing. 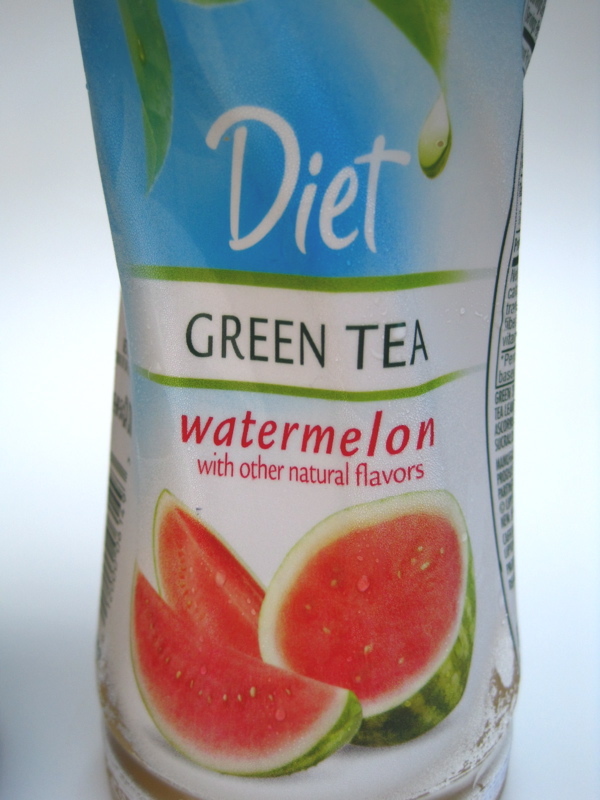 Guess I'll just have to eat some watermelon (which some of you are no doubt thinking I should have done in the first place!). I preferred the taste of this Arizona Pomegranate Green Tea, and at 18 grams of sugar per serving (high fructose corn syrup, for the sugar curious), of course I liked it! I just need to remember I am drinking the equivalent of candy! I enjoyed this iced, and as a rare treat I would probably purchase it again. 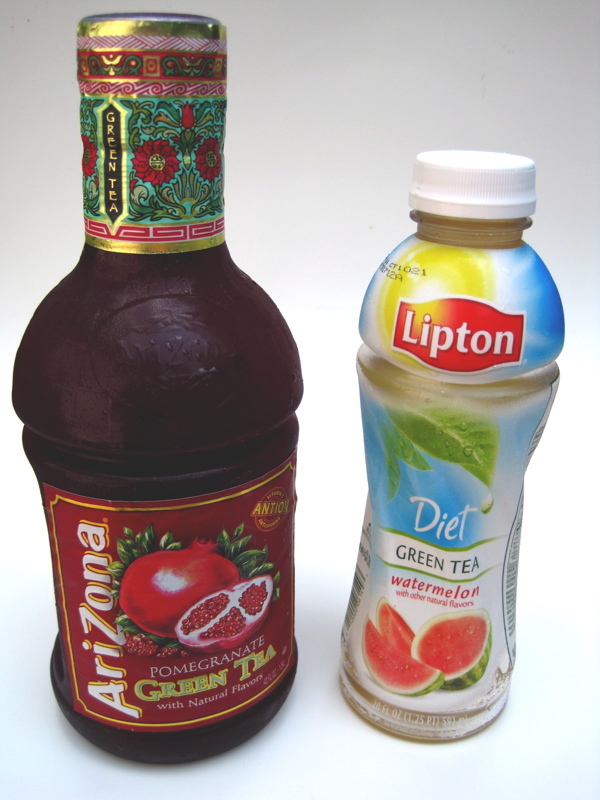 But I have learned it's very necessary to read the labels on bottled teas and be a savvy sipper! Marie! 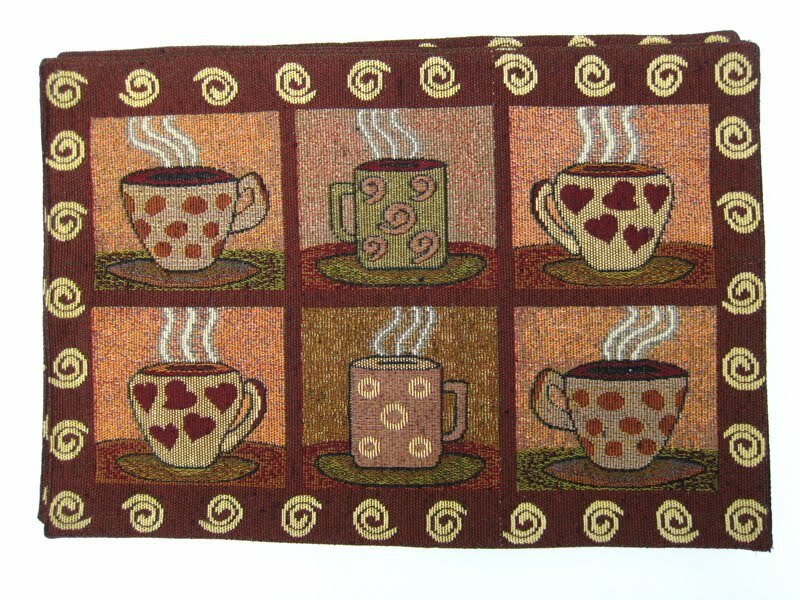 So if you'll send me your snail mail address via the e-mail button at right, I'll get these placemats headed your way. Congrats! Some people get excited when they see their favorite celebrity on the cover of a magazine, but I get excited when I see one of my teacups there! 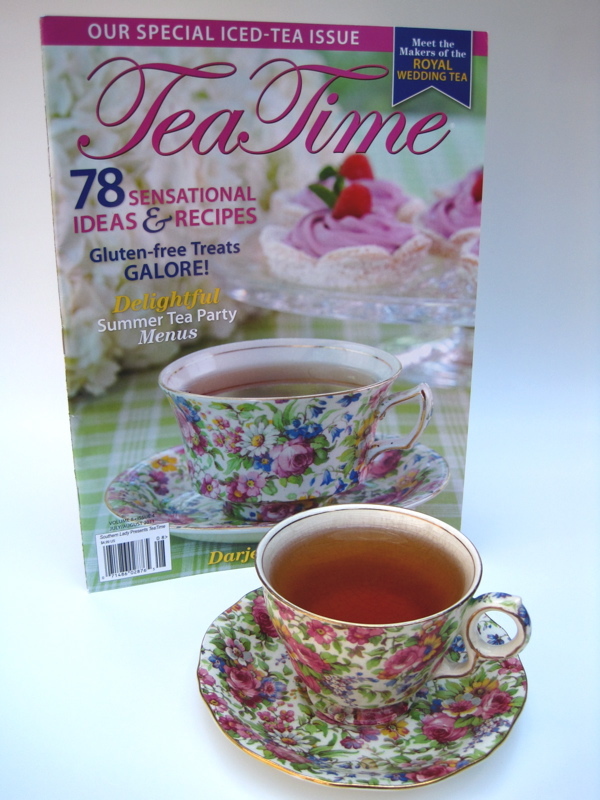 I got the new issue of Tea Time last week and naturally enjoyed seeing the Royal Winton Summertime teacup and saucer on the cover because I have a set in that pattern. The handle design on mine is different (and happily, I like my teacup's handle the best), but I adore Royal Winton's chintz designs and would love to have any of them! 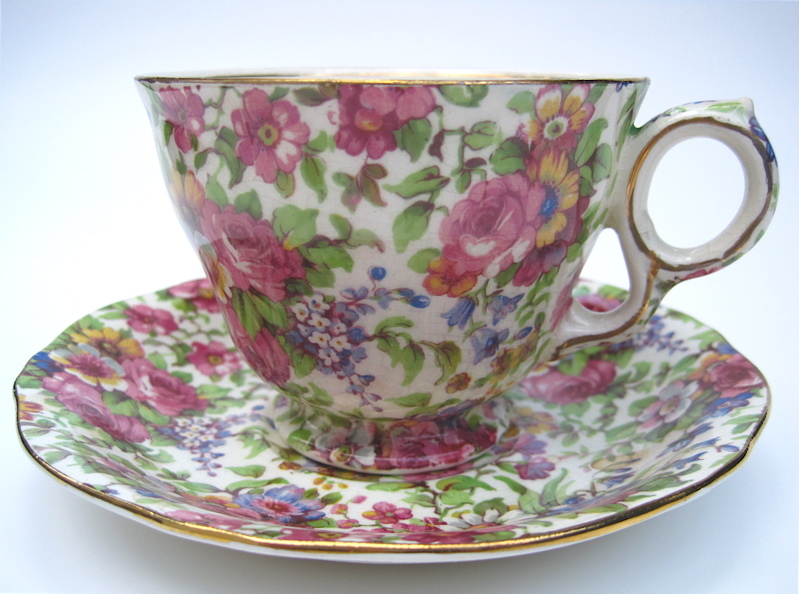 My teacup has a lot of crazing, but I still love its lush floral design. And this summer, at least, it's fun knowing Summertime is now a cover girl! 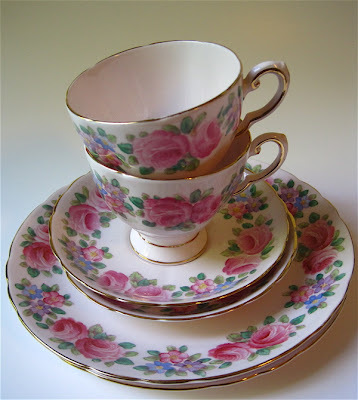 These larger teacups looked more tea-ish to me, until I got home, removed the cardboard packaging and discovered the words "cappuccino" and "mocha" on them! Ack! But ... 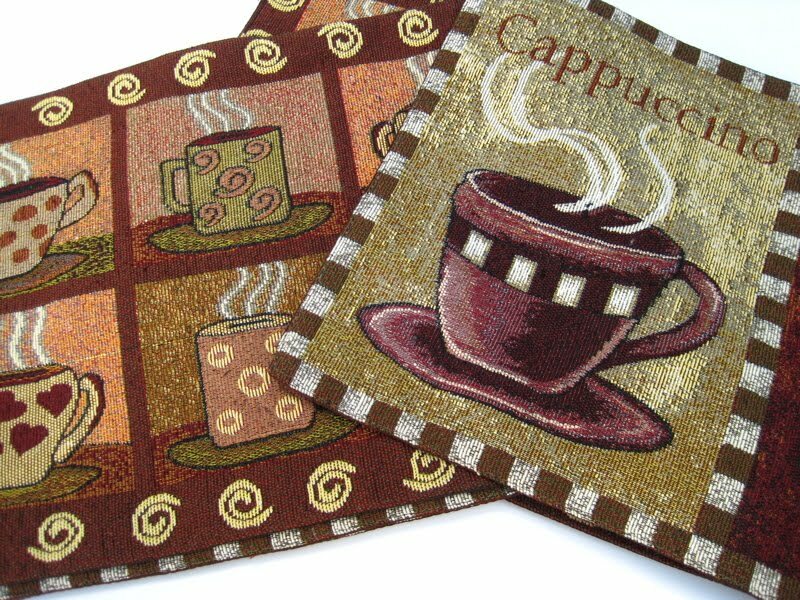 I like them anyway, and I think these would be very pretty on a fall table. 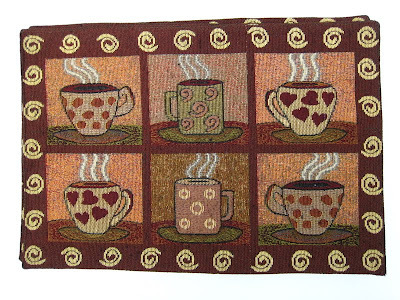 This design doesn't have any unexpected wording on it, and it, too, is pretty for fall decorating, but on the other hand it's also a little busier. So, I can see myself decorating with either set. 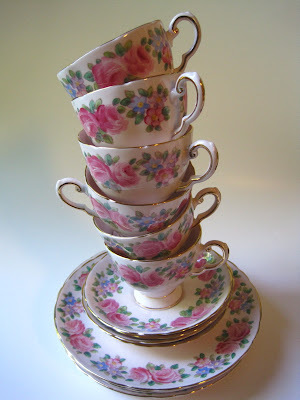 I'm perfectly fine with any of these, so please tell me if you would like to win A) the set with two cappuccino/mocha cups B) the set with the six teacups/mugs or C) two of each design. 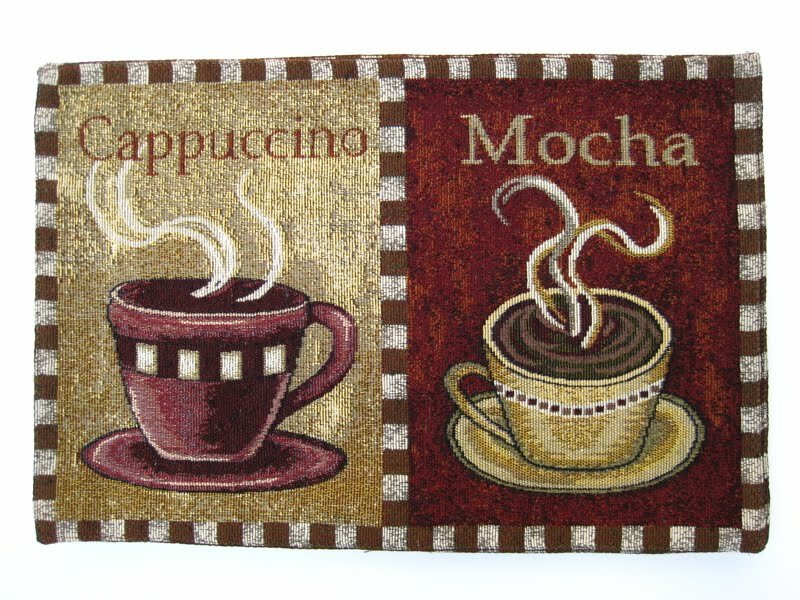 I'm not opposed to a little mix 'n match decorating, and besides, then you'd always have fall linens for you and one friend no matter what beverage she chooses! 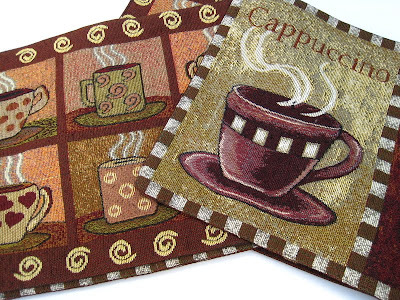 Just tell me your choice before 7 a.m. EST tomorrow and new placemats could be headed your way. Good luck! 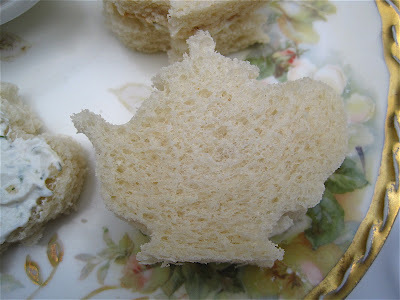 Wow, the year of experimenting with tea sandwiches is already halfway over! This week, I'm celebrating the fact some of our vegetables are starting to roll in from the straw bale garden out back. 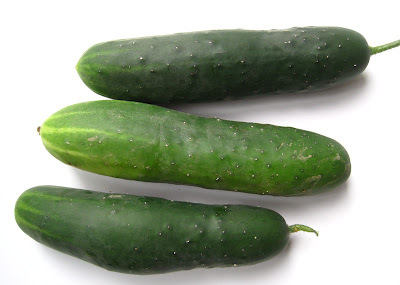 Yes, it's cucumber time! And though I've made Cucumber Cream Sandwiches before, I decided to tweak the recipe a bit and see if I couldn't take it up a notch. 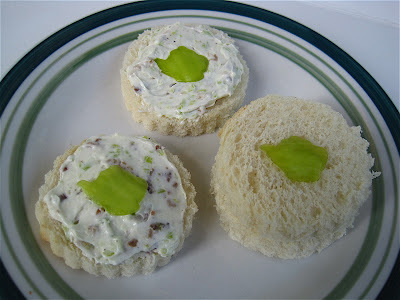 Sliced Cucumber Sandwiches are the teatime classic, of course, but on the occasions when I've needed to assemble a large amount of cucumber sandwiches at the last moment, that just wasn't practical. Cucumber Cream can be made the night before and solves that problem quite nicely. 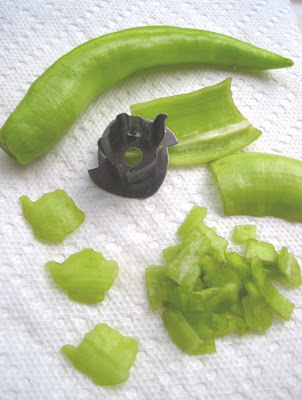 First, I sliced one large cucumber but left a bit of the peel on (for color) before I whirled it through the food processor. I processed it until it was quite soupy, and then I let the mixture drain in a strainer until it appeared to have the consistency of a cucumber slushy. 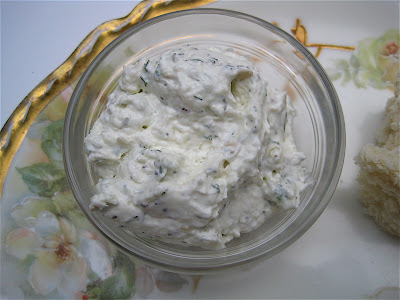 Then I mixed the processed cucumber with the cream cheese and other ingredients below, and the result was a deliciously light, whipped cucumber cream I like better than my original version! To make these sandwiches more "special," I like to cut them out with my teapot cookie cutters. 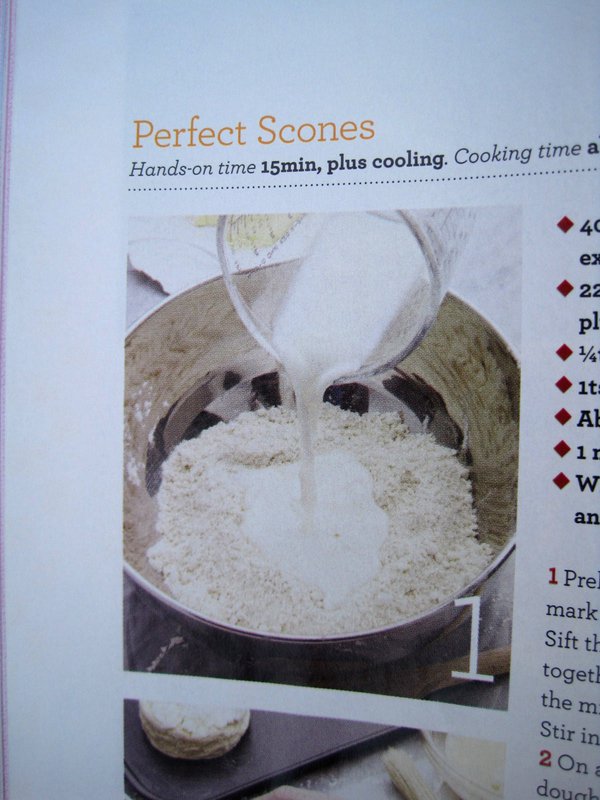 You definitely want to cut *frozen* bread, though, or else you are likely to lose that little knob on top of the teapot during cutting. The frozen bread helps the design remain intact. This is what the spread looks like on one slice, and to me it's not "pretty" enough to serve open-faced. The "sandwiched" sandwich looks nicer, I think. Let cream cheese soften to room temperature. Process cucumber and let drain. 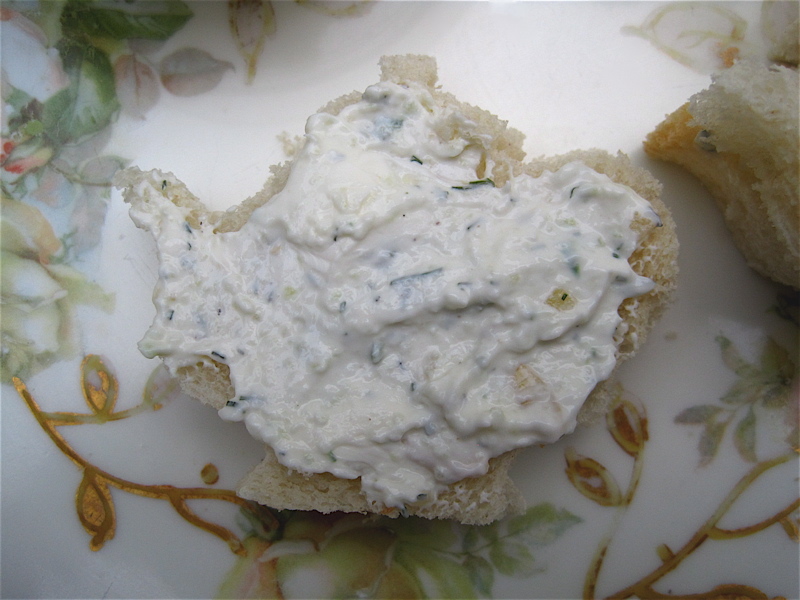 Add cream cheese, strained cucumber, pepper, dill and garlic in food processor. Process for several minutes until mixture achieves a light, airy consistency. This spread also makes a great dip for bread cubes or chips! After reading about some new powdered drink mixes from Bigelow, I headed to the grocery store to see if they were in stock yet. Alas, no, but I did find this box of Crystal Light Green Tea Peach Mango. I haven't had Crystal Light in years, so I decided I would give this flavor a try. Unlike some other beverage mixes I've bought recently, this one does actually contain tea. During the summer, I love to keep these tea mixes in my purse or tote bag so that a flavored glass of cold tea is always within easy reach. 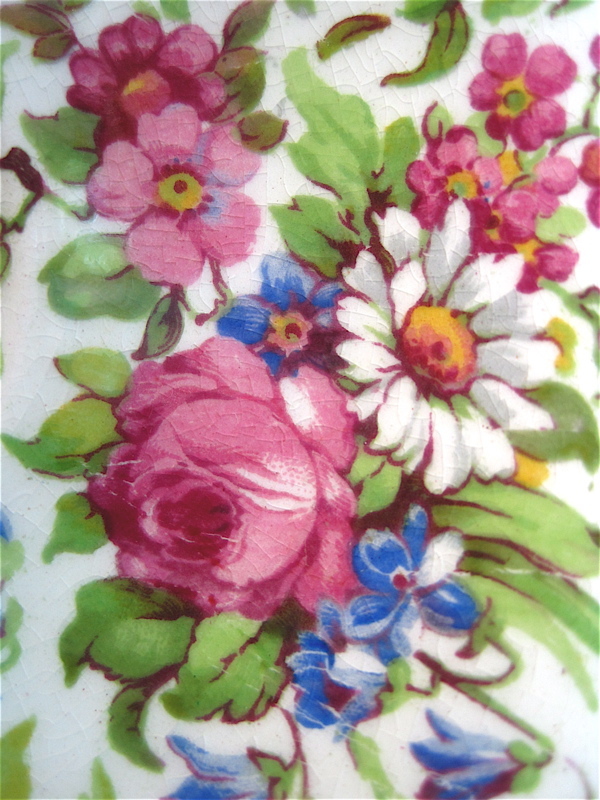 And this one? Delicious! 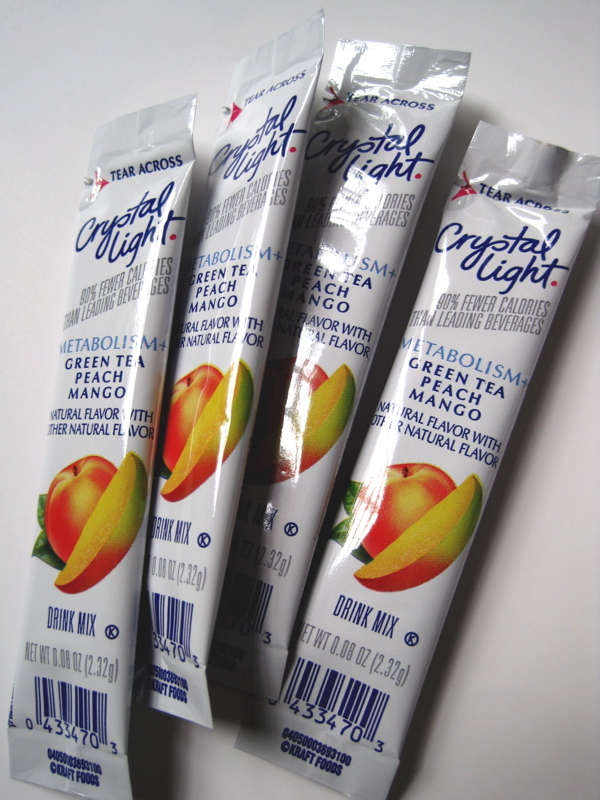 The peach and mango flavors really shine through. 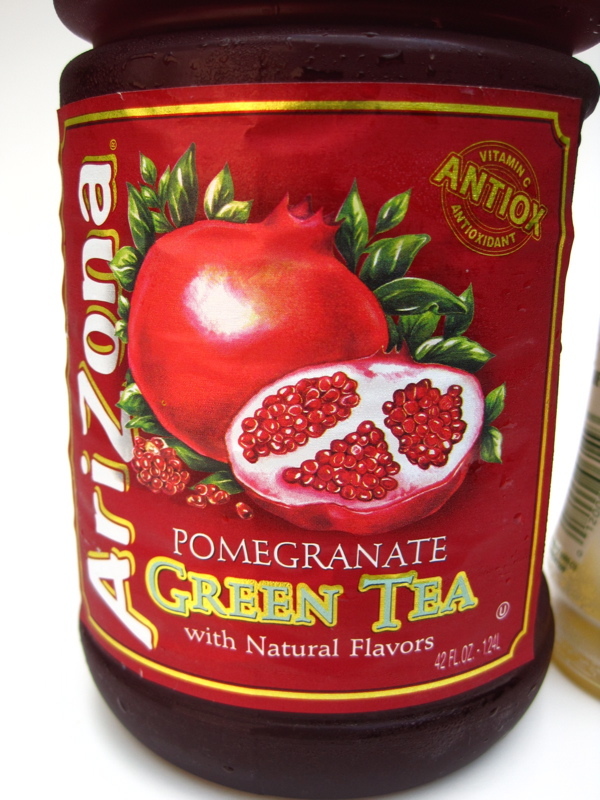 Another observation: If a tea mix turns dark brown in the bottle, I usually don't like it. If it's light colored, I do. Wonder why? Perhaps the coloring affects the flavoring? 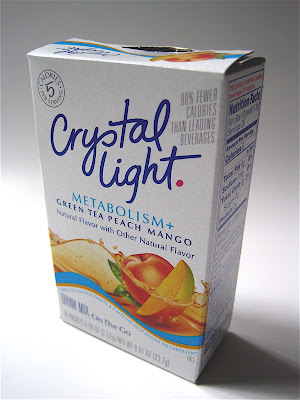 At any rate, I very much enjoyed this Crystal Light Green Tea Peach Mango and plan to buy it again. 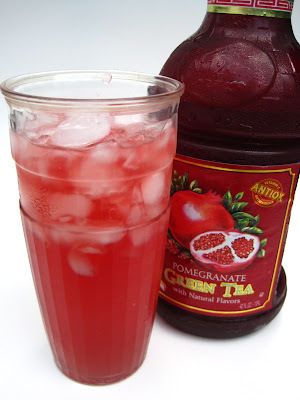 If you've tried any tea mixes this summer, I'm open to recommendations! 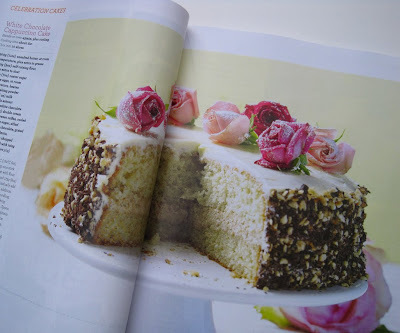 British magazines are some of my favorites to read, and recently I was reading British Country Living (not related to the Country Living magazine in this country) when I saw an ad for a special baking issue published by British Good Housekeeping. 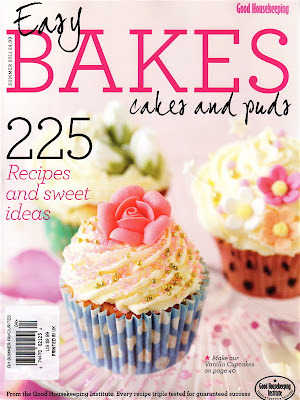 I lusted over it when I saw the cover photo but figured there was little chance of my finding a copy. Lo and behold, it was for sale at Barnes and Noble last week! This White Chocolate Cappuccino Cake is one of the prettiest treats I've seen in a long time! 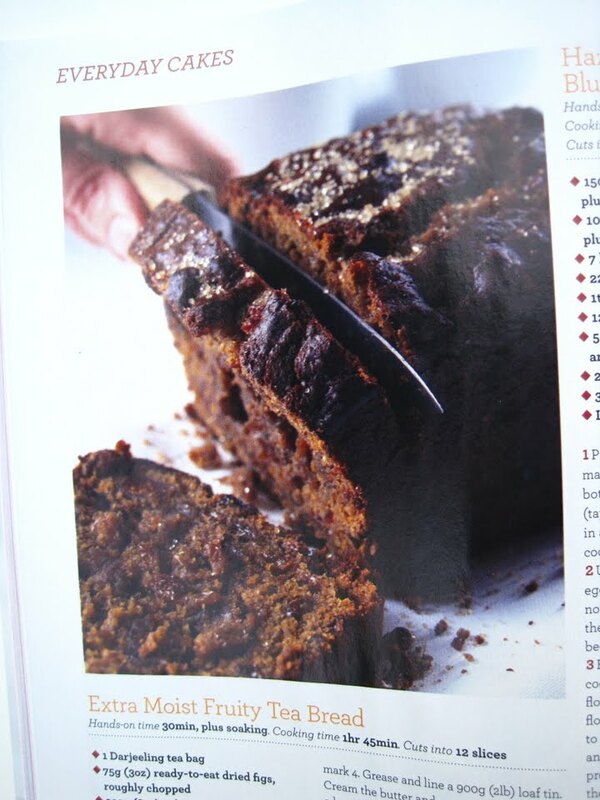 Extra Moist Fruity Tea Bread. This is one of those oversized issues and sells for $9.99, and I believe it's worth every penny. 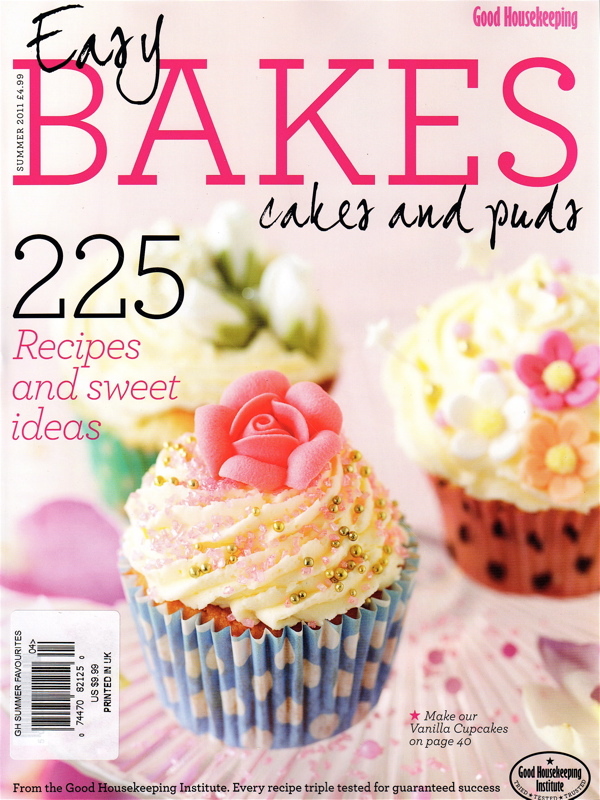 If you're a fan of baking, and I believe most of us are, take a look at this issue if you come across it! Well hallelujah and pass the scones, there's a new place to take tea here in Coweta County! 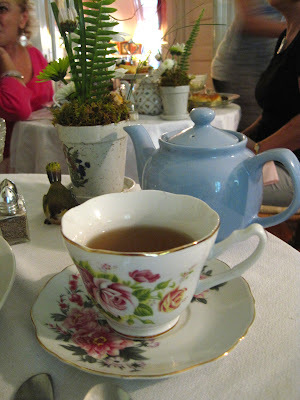 The Veranda, a well-known B&B in Senoia, started offering "Tea on Tuesday" a few weeks ago, and my shopkeeper friend Liz and I finally found a Tuesday where we both were able to go! 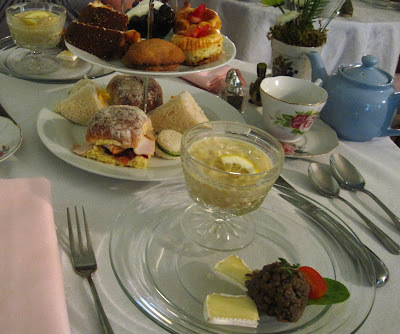 First, we walked in and entered a parlor type room where scones, cream, jam and glasses of iced peach tea were waiting (sorry, but I was famished and didn't stop for a photo!). The scones were delicious, and I enjoyed being able to meet and greet a few of the Senoia ladies I rarely get to see since I am almost always in downtown Newnan at lunchtime. 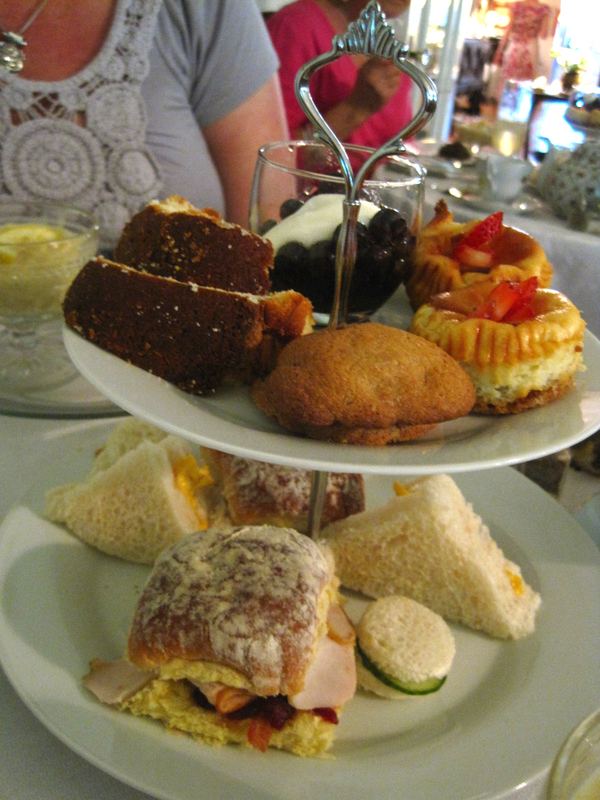 After a few minutes of mingling and eating scones (and the almond-flavored cream, which was divine! 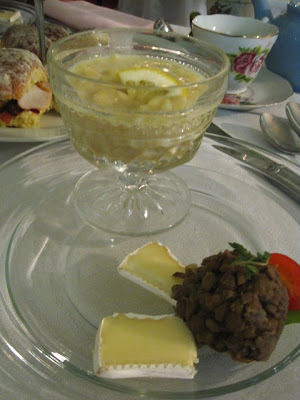 ), we were led to one of several rooms set up with tables laden with teatime fare. Some larger groups of women had obviously made their reservations together, but there were also tables for two like my friend and I enjoyed. I was surprised at the amount of food we received, and very, very glad I had skipped breakfast! 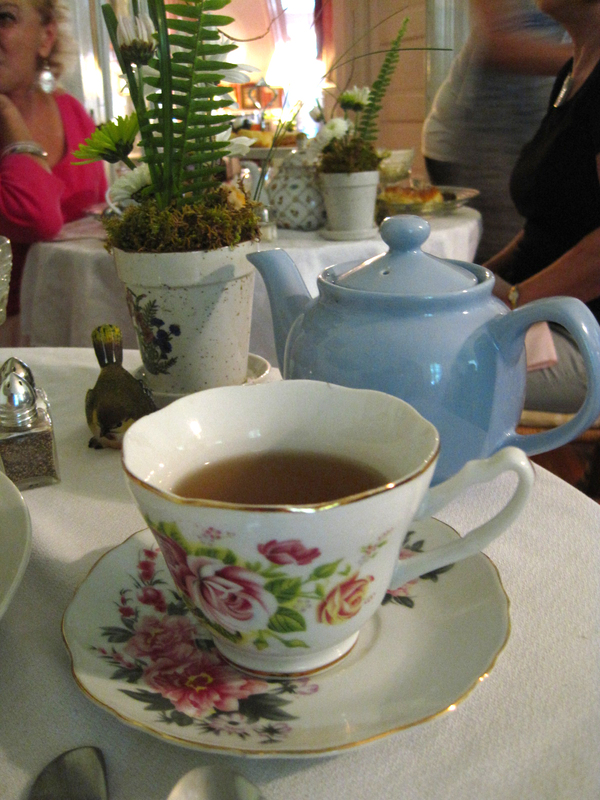 First, we had a pot of hot peach tea on our table, and iced teas (which we later had) were available as well. Here are the milk, sugar and lemon for the tea. We began our meal with an orzo pasta soup, which was tasty and quite hearty, and a Brie and Lentil salad I really enjoyed since I can't seem to get enough vegetables lately! 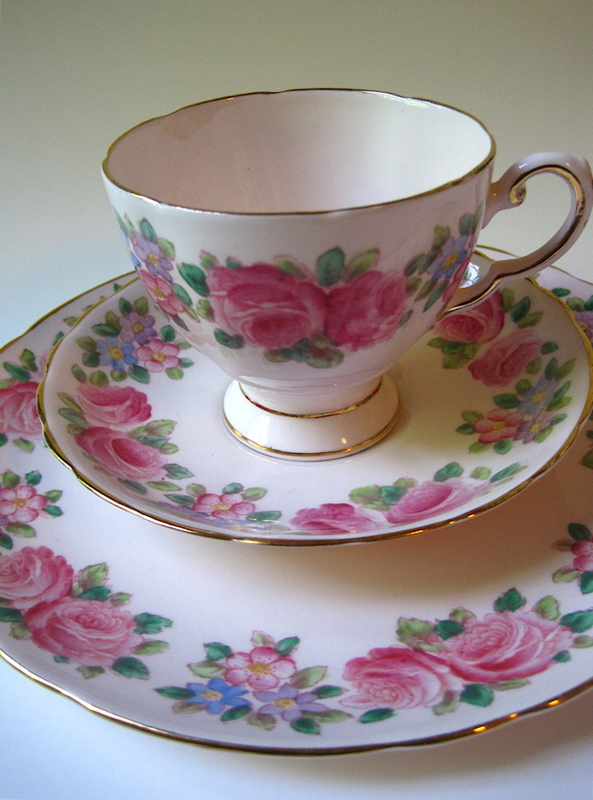 And now, the tea tray! Our three sandwiches included roasted turkey and cranberry chutney (served on a potato roll, so filling! ), a cucumber sandwich and a pimiento cheese sandwich. Sweets included a creamy fresh blueberry dessert, chocolate chip and walnut cookies, pound cake and mini cheesecakes. Liz and I agreed the cheesecakes were our favorite, but then we both *love* sweets. I should also mention that this bounty was just $15, which was more than reasonable, I thought. 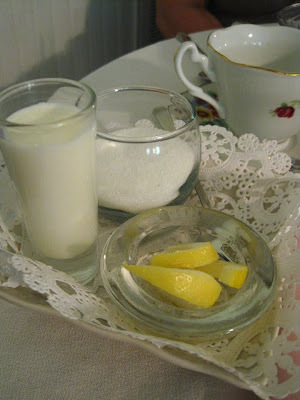 Laura, innkeeper at The Veranda, really did a lovely job of making all her guests feel welcome. I was also impressed she took a few minutes to recognize some local artists on hand (including some whose works are featured in a new art gallery there) as well as some local business owners. 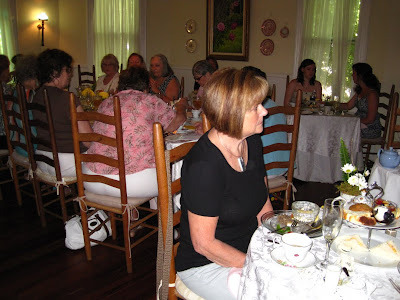 She seems to really have a heart for bringing her Senoia neighbors together, and what better way to do this than over tea! For more information or to see the menu for the next tea, as I did, go here. Every now and then I'm asked to speak to a church or civic club, and recently I was asked to speak to a local Kiwanis group about where writing ideas come from. I *love* to talk to anyone who will listen about writing and creativity, so I was happy to be invited. 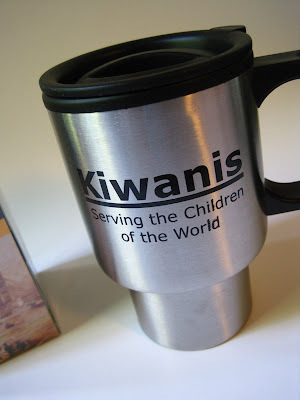 These particular Kiwanis ladies are always so nice to me, I was pleased to get to talk to them again. I was even happier when the club's member Louise, a fellow tea lover, presented me with this great thank-you gift! 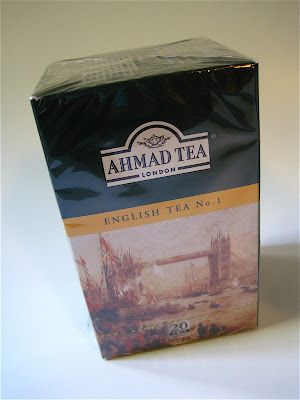 She became a fan of Ahmad's English Tea No. 1, a wonderfully brisk black tea, on a trip to England and now buys it by the case. 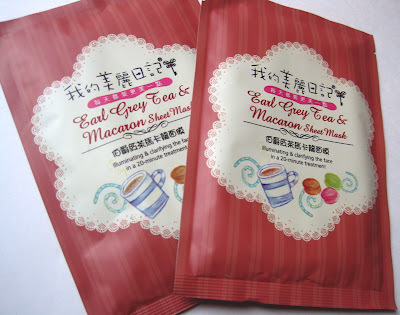 She had shared some of this tea with me before, and since it was long gone I was happy to receive another box of it. This time I tried it iced, and it was just delicious! 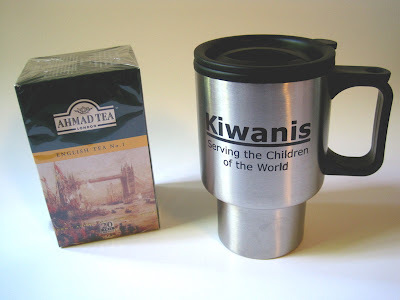 She also included this stainless steel mug, which of course a tea lover would realize is perfect for transporting hot tea. I believe this is the first time a civic club ever gave me tea for speaking, and it was absolutely the perfect gift! Heidi Thibodeau! 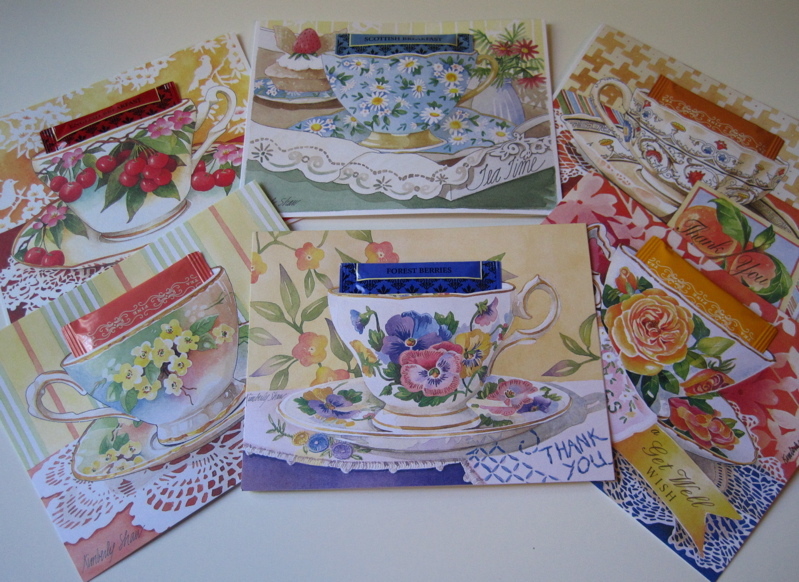 If you'll send me your snail mail address via the e-mail button at right, I'll get these goodies headed your way. Congratulations! What if I told you it was $22 for the trio? Would that make you feel better about it? OK then. What if I told you it was $22 for TWO trios? How 'bout that? Well shoot. You folks drive a hard bargain. What if I told you it was $22 for the whole shebang of 16 pieces in mint condition? That's six teacups, four saucers and six dessert/salad plates of "Tuscan Fine English Bone China, Made in England." You would have gotten them too, wouldn't you? (I know Linda J. or her friend Mary would have!) Once I realized the bargain ($1.375 each piece, I did the math), I knew these wouldn't be there next time I went in the store. 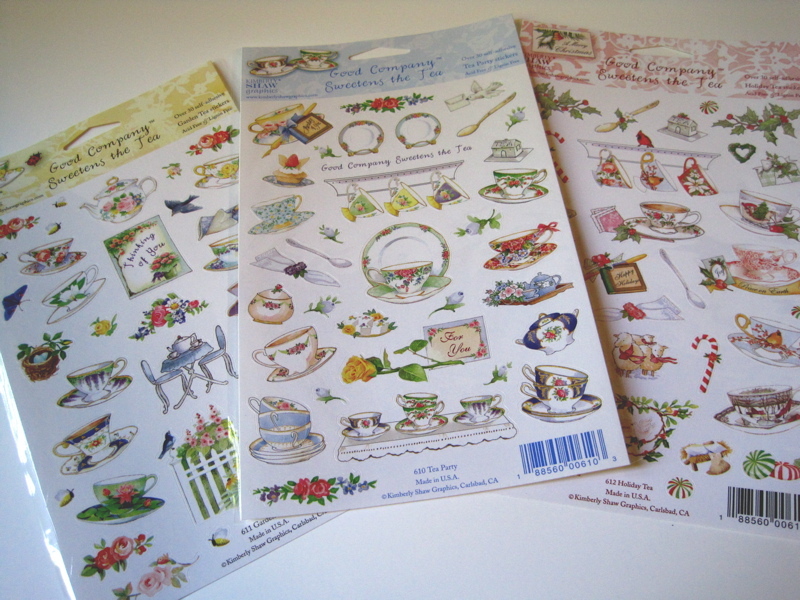 In fact, I got up to the register and the lady in front of me smiled and said, "I almost got those! That's a great deal." I thanked her for leaving them for me. 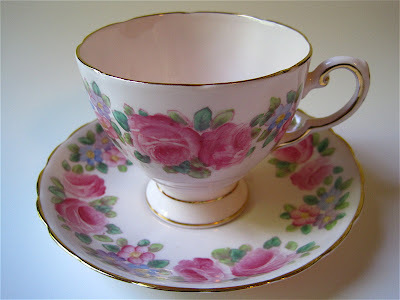 And then I went home and had a celebratory cup of tea. And I'm not ashamed to tell you! Do you like peppers? 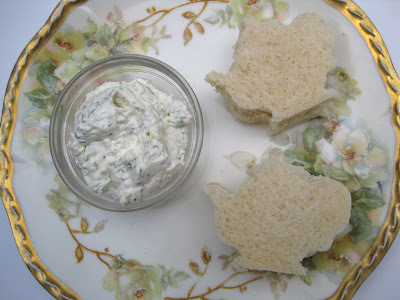 I like the milder ones, and the banana peppers are coming in strong at my house, so I decided to simply use a couple of the peppers in this week's tea sandwich recipe. And after last week's play-with-your-food fun with the Tomato Roses, this week I decided to make Banana Pepper Teapots! 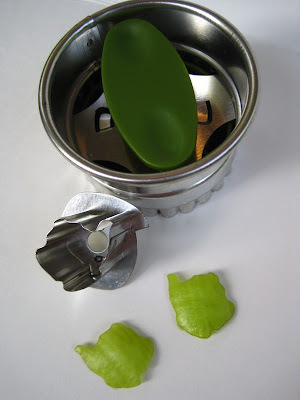 I actually had the idea a while back: Why not see if my good old Linzer cookie cutters with the teapot insert could chop a tiny chunk of raw vegetable? After slitting and flattening one of the peppers, I simply used the cookie cutter insert on a cutting board to press out a teapot-shaped piece. Easy! 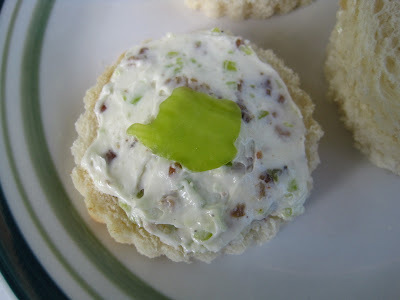 When I looked online, I noticed that the pairing of banana peppers, cream cheese and bacon seemed to get a lot of good reviews, so here's how I made my spread. 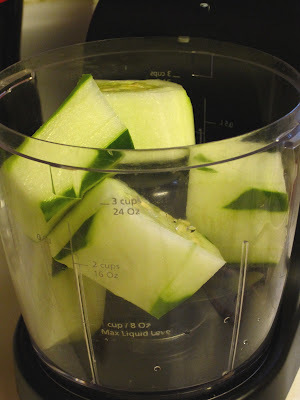 Combine first three ingredients in food processor just until blended. You still want to see some chunks of the peppers. Add salt and pepper to taste. 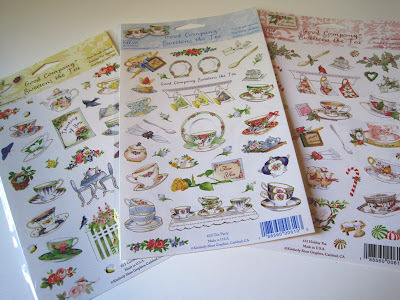 It's time for the last of the Kimberly Shaw stationery giveaways I began earlier this year, so I hope if you've been lusting after some of her great products you'll be sure to enter! This giveaway will run through Monday at 7 a.m. EST. First, the winner will receive six of Kimberly Shaw's beautiful tea-themed cards, all with a teabag tucked into the design. 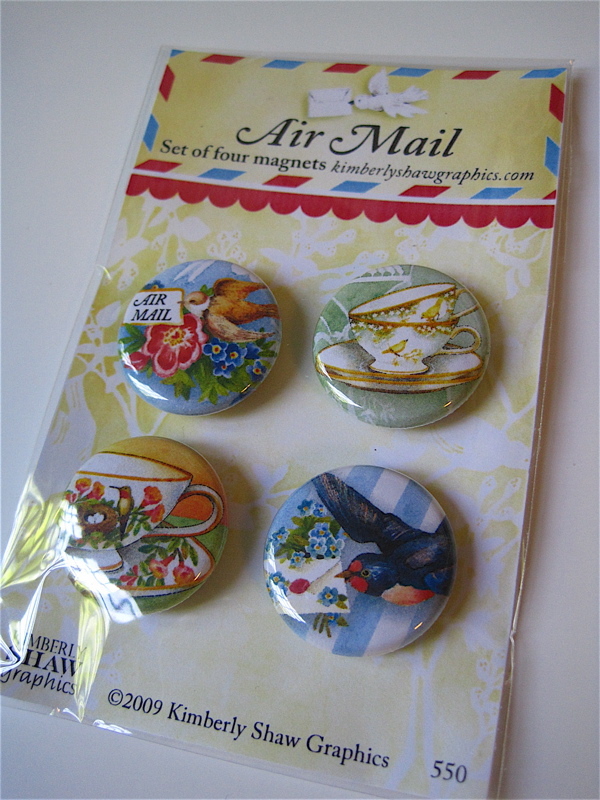 There are also four great little magnets featuring her designs. Whose refrigerator magnet collection couldn't use a little sprucing up! The winner will also receive sheets of all three of these sticker designs, including some that will let you get a head start on Christmas! Just let me know you'd like to be entered, and I'll announce the winner sometime Monday morning. Good luck! Imagine my surprise when Marilyn, my tea friend in Oregon, told me she'd gotten something for me at a 7/11 store on her recent trip abroad to visit Thailand and Taiwan. I was quite curious to see what it was, because I do love a good surprise. 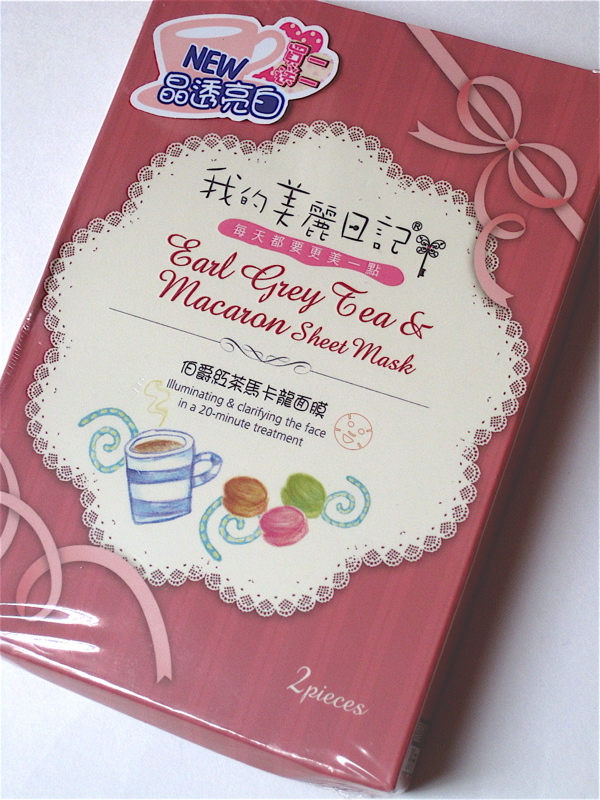 She knows me well because yes, this Earl Grey Tea & Macaron Sheet Mask definitely would have caught my eye! 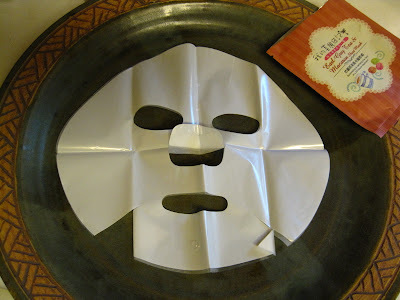 This box actually held two packets, each containing a sheet mask doused in good-for-you things like black tea, aloe and fruit extracts. 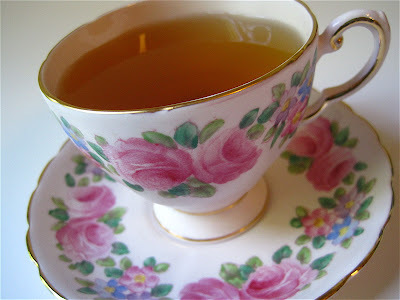 It smelled nothing like tea, but it did smell quite good! 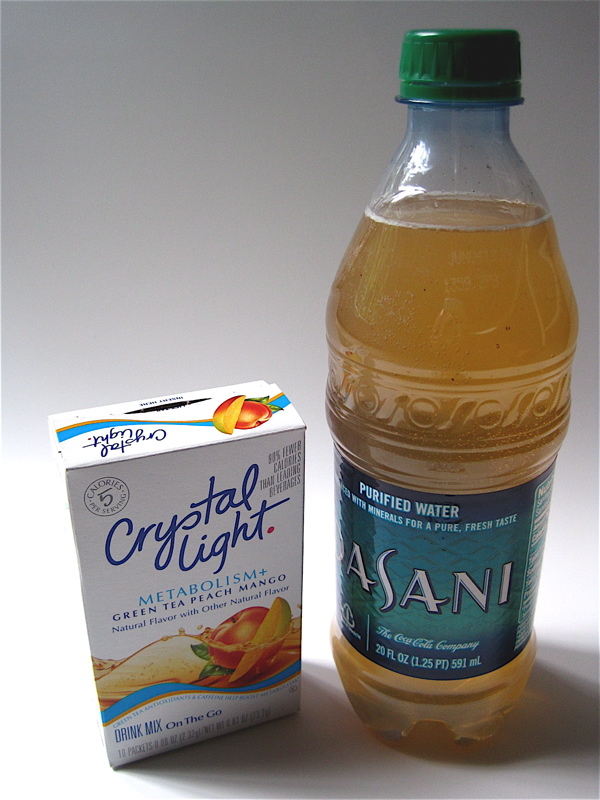 It's National Iced Tea Day!